Channels: All VHF radios have the same 55 channels with U.S., Canadian and International menus (your radio has a U/I/C option). Boaters can listen to any of them, but most are reserved for government, commercial shipping or Coast Guard use. You can transmit on about 12–15 channels. Antenna: Your antenna installation is the most important variable affecting the operating range of your VHF. Mount your antenna as high as possible—on the mast of a sailboat or on the superstructure of a powerboat. Use an antenna with 6dB or 9dB gain on powerboats and 3dB gain on sailboats (see the West Advisor on Selecting a VHF Antenna. Use large-diameter, low-loss coax cable with properly installed connectors and run it as directly as possible to the radio. Standard’s Explorer GPS GX1700 is the first VHF radio with a built-in GPS receiver(the 12-channel GPS antenna is built into the front panel). What’s more important are DSC’s emergency capabilities—functioning like a sort of coastal EPIRB. In an emergency, one push of a button causes your radio send an automated digital Mayday message on VHF Channel 70, which can be received by the Coast Guard and all other vessels within radio range. The Channel 70 MAYDAY transmission incudes your vessel ID number (called an MMSI Number), your position and the nature of the emergency (undesignated, fire, flooding, collision, grounding, capsize, sinking, adrift, abandoning, piracy, MOB). After this information has been sent, the radio automatically switches to Channel 16 for voice communication with rescue personnel. All DSC radios sold since March 2011 (Class D radios) have a separate “watch standing” receiver that constantly monitors DSC Hailing Channel 70. The radio’s other receiving channel is free to listen to any other channel. Radios built to these standards also include additional features including added memory to store other vessels’ MMSI numbers. Older radios may only have one receiver; consequently you could miss an emergency call while listening on a different channel, or you may not have DSC at all. The Coast Guard has upgraded their coastal Search and Rescue capabilities with modern digital electronics known as Rescue 21. Rescue 21 eliminated gaps in VHF coverage over the entire coastal US, the Great Lakes and some major rivers, allows accurate, precise triangulation of the location of Mayday signals within 20 miles of the coast, and allows enhanced digital recording and playback of distress calls. 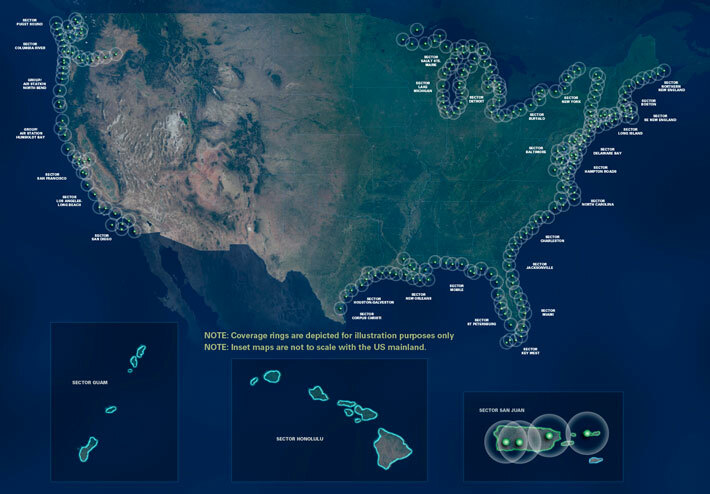 As of 2015, it covered 41,871 miles of coastline in the Continental United States (see coverage map). The Coast Guard’s Rescue 21 emergency network makes your VHF radio equivalent to a sort of coastal EPIRB. If you have properly connected your VHF to a GPS receiver and have registered with an MMSI Number, the Coast Guard will know who you are, where you are and the nature of your emergency. Connect your VHF radio to a GPS receiver. See our West Advisor on Enabling Your VHF Radio’s Safety Features for more on how to do this, and why it is of critical importance in an emergency. Compact radios: Typical compact units measure about 6" wide x 3" tall x 5"–6" deep. Standard Horizon makes two of the smallest. The cases on the GX1700 and GX1600 are only about 3 1/2" deep, so they’re a good choice for a small boat. Black box designs: ICOM’s M400BB and Garmin’s VHF 300 are another space-saving alternative, with a modular design that positions the guts of the radio in a remote, sheltered location, with only a small handset and speaker panel taking up your valuable space on a crowded instrument panel. The Ray260 VHF Radio with Integrated AIS Receiver combines a black box VHF and receive-only AIS to help you avoid collisions among crowds of AIS-equipped ships and other vessels. It allows you to keep track of current and previous positions of all your radio contacts on your compatible Raymarine chartplotter. Many radios can use one or more optional full-function microphones that even include a channel display. 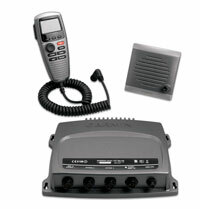 Change channels, change volume levels, add or delete channels from the scanner's memory—all are possible from the keypad included in these miniature second stations that are ideally suited for the flybridge, tuna tower, navigation station, cockpit, or wherever you can use VHF communications. The inclusion of a hailer is one of the upgrades from entry-level to higher end radios. The installation requires an external waterproof speaker to broadcast your voice to line handlers, other vessels, or your first mate on the foredeck. A feature called Listen-Back turns any speaker into a microphone and amplifies faint sounds (although most speakers make lousy microphones) enabling you to communicate with that foredeck hand or listen for fog signals. Some radios include a foghorn that broadcasts over a PA a variety of signals that are legally required when operating in reduced visibility. These may include "underway", "stopped", "sailing/fishing", "under tow", "at anchor", "aground" and others. 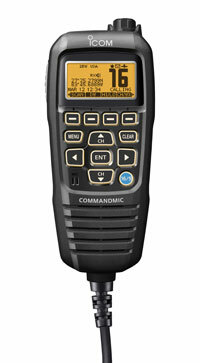 COMMANDMIC IV shows off ICOM’s new family user interface. Bottom line of the dot-matrix display shows soft key functions that you toggle to with left and right buttons. Multi-function rotary knobs are quicker than keys when changing a function. The knobs on the Garmin GHS 20 and ICOM COMMANDMIC III control channel, volume, squelch and other features. AquaQuake™ water draining function on some ICOM radios clears the speaker of water, emitting a vibrating noise, so the audio is less distorted in really wet boating situations. Garmin VHF 300 AIS is a black- box radio, with only the handset and speaker on the instrument panel. NMEA 2000 networking. Fixed VHFs feature automatic weather alerts, which notify you when they detect a special weather warning signal from NOAA, to inform you about thunderstorms, tornados or other extreme weather. When the radio detects a special warning signal from NOAA, it sounds a special tone. Some radios include an improved weather alert function, Specific Area Message Encoding (SAME), so you only have to listen to alerts for localized weather in your area, and not be interrupted by forecasts from many miles away. Virtually all radios have a jack or connection for an optional external speaker. This can make it far easier to hear the radio in a noisy environment like engine noise in the cockpit, or wind or water noises. Lots of boats are on the water and in some areas boaters have difficulty finding a clear frequency, with interference from signals on adjacent channels making it hard to hear messages. Many metropolitan areas have radio frequency interference from lots of sources. Some radios offer better performance in filtering out RF signals, referred to as intermodal rejection, that is, how well the radio hears only what it is supposed to hear. Generally, modern VHF radios have increasingly sensitive receivers. Another problem happens when boaters near you can pick up distant signals, but you can't. Assuming that your antenna, cable and coax connectors are in good working order (and with corrosion in a salt-water environment, this is a big assumption), you may have a problem with the sensitivity of your receiver, how well the radio hears or how strong the signal must be to be heard. We include these two specs, under the heading of Receiver Performance, for the radios we sell. Rejection is measured in decibels. Bigger numbers are good and mean that the radio in question can filter out stronger nuisance signals. Sensitivity is measured in microvolts (µV@ 12dB SINAD), and smaller numbers are superior. Remember that the type and quality of your antenna and its height above the water are the most important factors in receiver performance.